This newly built private beach house has 4 bedrooms and 3 bathrooms. This house has it's own private pool & sleeps a maximum of 10 with 1 king, 3 queens & 1 sleeper sofa. 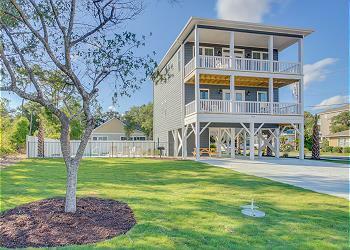 This beach house sleeps 10 and it has something for every member of your vacation group. Take a swim in the PRIVATE outdoor pool. This house was just built in in May 2017 and has granite counter-tops, stainless steel appliances, wood flooring, flat screen TV’s in the living room and all bedrooms, free Wi-Fi access, a washer & dryer and 2 balconies with great ocean views. The house is only 1 (small) block from the beach. Getting to and from the beach is very easy and only a just a short walk (3-5 minutes tops). A fully equipped kitchen, including refrigerator, stove, microwave, dishwasher and everything you need to make a meal and an outside BBQ area that will satisfy everyone's hunger after a long day at the beach or pool. If you don’t feel like cooking, that’s not a problem. There are tons of nearby restaurants to choose from.